Rediff.com » Sports » Real-ity bites: Will Jose Mourinho survive being made a scapegoat at the Bernabeu? Real-ity bites: Will Jose Mourinho survive being made a scapegoat at the Bernabeu? 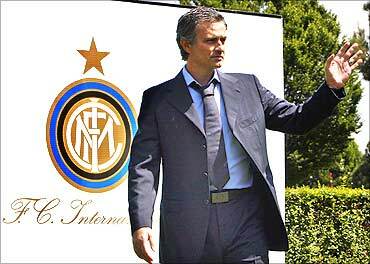 Jose Mourinho was formally presented as Real Madrid's new coach on Monday. Senior Associate Editor Bikash Mohapatra wonders if the Portuguese will survive the 'curse of Bernabeu' that has witnessed as many as 23 coaching changes at the club in the last 21 years. Jose Mourinho was on Monday presented as Real Madrid's new coach. The deal was through on Friday, with Real paying Inter the required compensation -- the modalities had been sorted out early last week -- and the appointment ended weeks of speculation. Even before the formal announcement was made, skeptics had pointed out that Mourinho's defensive approach won't gel with Real's attractive game and he would struggle. The Portuguese did his bit (of explanation), saying he will make the necessary adaptation. "My Madrid will always play well, attack and be winners," Mourinho was quoted as saying in The Sun. However, the pragmatic person he is, Mourinho might be very well aware of the rigours of his new job and the impending eventuality. Real's recent record with regard to the treatment meted out to its coaches isn't something to be proud of. The coach is more often than not made the scapegoat. And going by their rule book, success of a coach is imperative, but it doesn't necessarily guarantee a long tenure, else Vicente del Bosque and Fabio Capello would never have lost their jobs at the times they did. Pertaining to coaches, Real Madrid is neither as lenient as Arsenal nor as persevering as Manchester United. Had Arsene Wenger been the coach of Real, his contract would long have been terminated, forget having five trophyless seasons. And Sir Alex Ferguson, considering he won nothing in his first four years in charge, would never have got the chance to build a winning formation, let alone have a chance at winning titles for 20 years on the trot. For that matter, Rafa Benitez is lucky he is coaching Liverpool, not Real! In the last 21 years, ever since Dutch veteran Leo Beenhakker successfully completed his first stint (three years) in 1989 with a hat-trick of titles, the club management has been generous in giving pink slips to the men-in-the-suit. For those interested purely in statistics, Real have had 23 coaching changes in that period. Mourinho is the 24th coach in charge. The magnitude of his success was so much that Real didn't hesitate to replace Manuel Pellegrini, who had taken charge just a year back and definitely deserved another chance to get something out of his ensemble cast. The Chilean's plight at the Bernebeu was akin to that of Claudio Ranieri at Stamford Bridge; both finished second in their first year of managing high-profile squads, Mourinho being the common replacement in both cases. And Florentino Perez's demands aren't any different from Roman Abramovich's. The Chelsea owner was in desperate need of a coach who could secure a first league title for his club in 50 years and then win the Champions League. Real haven't won the league in the last two years, so that becomes the immediate objective. And they haven't won Europe's premier club competition since 2002, having failed to get past the second round in the last six years. So that is palpably Perez's ultimate objective. 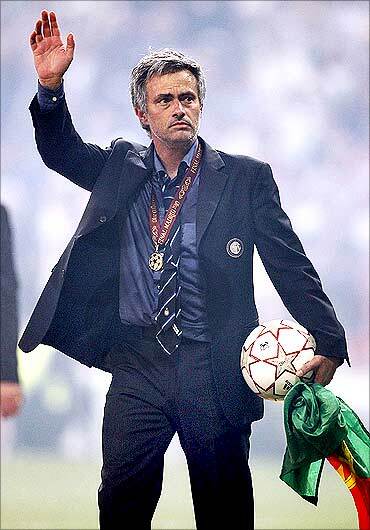 Mourinho managed to fulfill the first target at Stamford Bridge, winning successive Premier League titles in 2005-06. However, he failed to deliver Champions League glory, falling at the semi-final hurdle for two straight years. Abramovich rewarded him by offering him a pink slip midway through his fourth year in charge. On a positive note, the Russian billionaire did have the patience to allow the Portuguese at least some time -- three-and-a-half seasons -- to build a team. Expecting as much time from Perez would be a bit too much. The Real boss' tacit diktat for Mourinho would be simple: deliver or get dismissed. The Portuguese has to win the league as a minimum requirement for the first season and then ensure Real a tenth Champions League success in his second season in charge. Else, it is difficult to imagine him continuing as coach, his four year contract notwithstanding. In order to make this answer an affirmative, it will require a special effort from the 'Special One'. Perez has made his stance clear though. 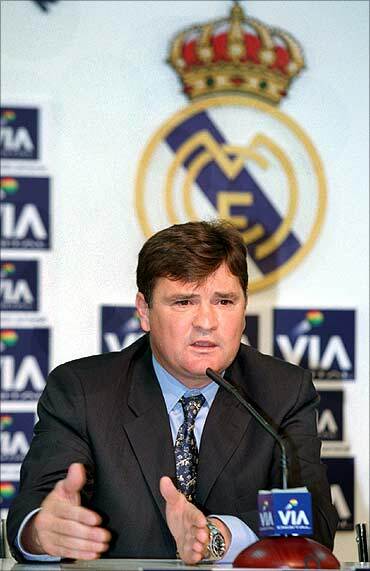 "Madrid bets on stability, but stability for the fans is winning and being leaders. Stability isn't about keeping on a coach," he declared last week. Let's hope Mourinho has got the point. However, as we wait and watch what lies in store for the Portuguese manager in the Spanish capital, let's take a look at the treatment meted out by the club to its various coaches in the recent past. Usually it is once bitten twice shy. In case of Fabio Capello, though, it is twice bitten thrice shy! The Italian had faced the axe despite delivering the league title in his first spell in charge in 1996-97. However, the Real bosses somehow managed to coax him into giving the job a second try. 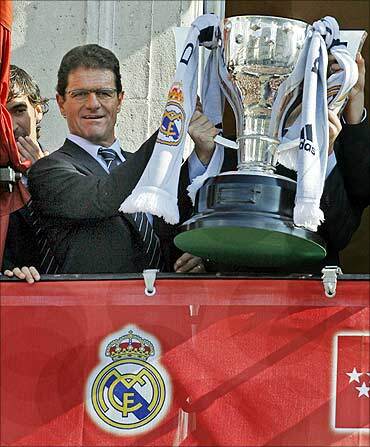 Capello delivered again, winning the La Liga, the club's first major trophy in almost four years, and a perfect farewell for David Beckham. And so did Real... the pink slip to the Italian. The reason given was the same: a marked deviation from the attacking style of football that is associated with Real. Capello got himself a better deal though getting the coveted job of England manager. The German helped Real Madrid achieve what no coach had achieved in 32 years. Jupp Heynckes's men beat Juventus 1-0 at the Amsterdam Arena to ensure a seventh European title and a maiden Champions League win, but a first since 1966. However, the lack of domestic success -- Real finished a miserable fourth that season, a whopping 11 points behind winners Barcelona -- ensured his contract was terminated. The German, after changing many clubs since, is now in charge of Bayer Leverkusen. Guus Hiddink's credentials as coach is unparalleled. The Dutchman's impressive repertoire includes guiding the Netherlands (1998) and South Korea (2002) to World Cup semi-finals and Russia (2008) to the European Cup semis. His major achievements at the club level came with one club: PSV Eindhoven. But that's not saying he failed at the other clubs. In fact, he was successful elsewhere, but was never given the free hand that he had at Eindhoven to work on his team. Real Madrid was one of the clubs that didn't give Hiddink adequate time to come out with an all-conquering side. Drafted in as a replacement for Jupp Heynckes in May 1998, the Dutchman wasn't allowed to complete even a single season in charge. 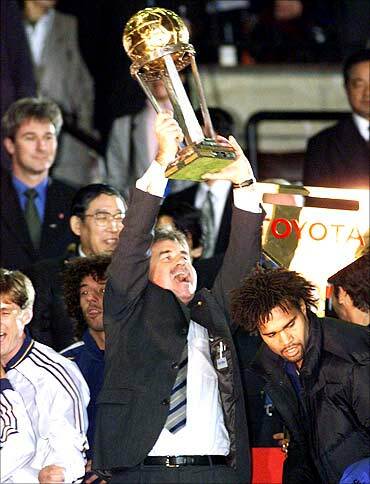 Hiddink did win the Intercontinental Cup Real, beating Brazilian side Vasco da Gama 2-1 in Tokyo, but poor league form and his off-pitch remarks about the management meant the Dutchman was shown the door sooner than expected. 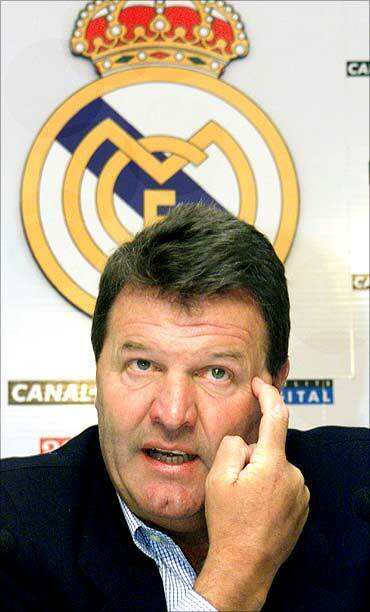 During his first stint (between June 1989 and November 1990) at the Bernabeu, John Toshack was successful in winning the Primera Liga. However, the encore was anything but pleasant. Asked to step in after Guus Hiddink was sacked, the Welshman was replaced as quickly as he was signed. During his second stint Real struggled in the league, eventually finishing a woeful fifth. The management needed no further excuse. Even winning consistently cannot guarantee you stability at the Bernabeu. How else does one explain the exit of Vicente del Bosque, the club's most successful coach in recent times. 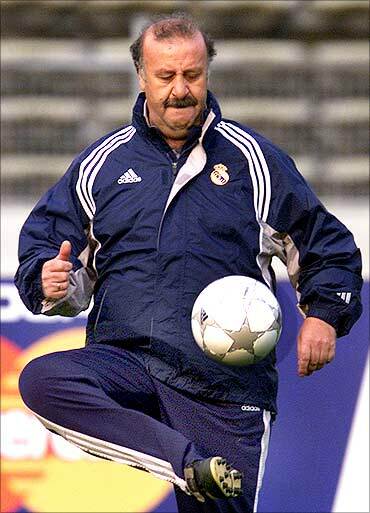 Despite frequent boardroom interference, del Bosque did manage to build a strong side and his cabinet of trophies was impressive -- two Champions League titles (2000 and 2002), one Intercontinenttal Cup, one European Super Cup and two Primera Liga titles amongst others. However, when it came to terminating his contract the Real management didn't hesitate a bit. The present coach of the Spanish national team has been quoted as saying that Real shows no respect to the position of the coach, giving the person in charge no authority internally or externally. But the Spaniard was in a way guilty himself. He had had two brief stints at the club, in March 1994 and January 1996, but failed to understand the club's modus operandi. The former assistant to Sir Alex Ferguson must have rued leaving Old Trafford after his stint at the Bernabeu lasted less than a year. 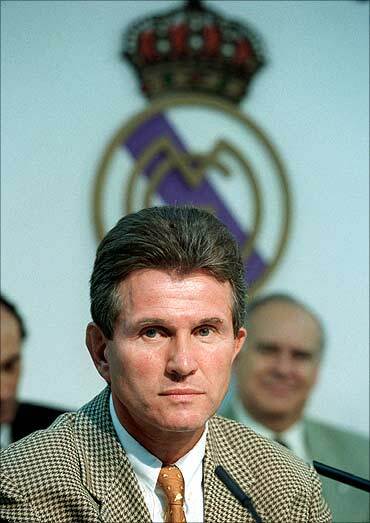 His period in charge coincided with the end of the galactico era, which subsequently hampered his side's prospects. He also failed to convince the incumbent Real president (Perez of course) to get things done the way he wanted. That year Real failed to win anything significant. They did start the season well, winning the Spanish Supercup and topped the La Liga table at the winter break. But they eventually finished fourth in the table. And as the season ended, the Real bosses did what they do best: showed Queiroz the exit. As a player in Real colours, Jose Antonio Camacho was a stalwart, making 414 appearances between 1973-89 and winning nine Spanish league titles, three Spanish Cups and two Uefa Cups. 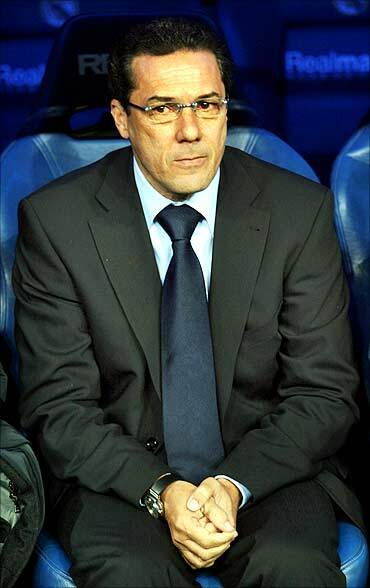 How his two stints as a coach at the Bernabeu could be summed up in just one word: disappointing. Camacho only took over in May for his second spell in charge but Real had a poor start to the season and were placed eighth when the coach called it quits. Camacho's stint lasted for just four months. 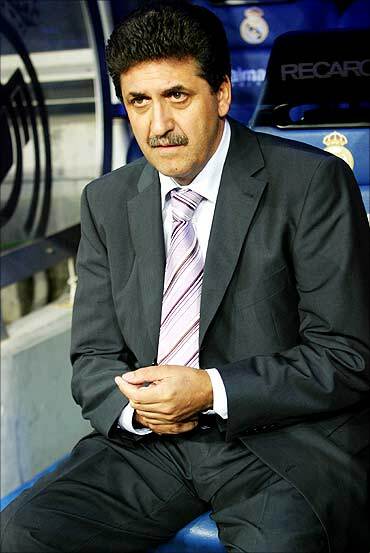 The veteran, a former coach of the Spanish national team, walked out on the club complaining of continued interference. Camacho had lasted just three weeks in the summer of 1998 before also walking out -- that time over a disagreement with former chairman Lorenzo Sanz. He played as a goalkeeper with the club and later became an assistant coach. Was asked to take charge after Camacho's departure but lack of results ensured his stint was as long as his predecessor's. To give him the benefit of doubt Remon had always maintained he only accepted the job at the request of his predecessor Jose Antonio Camacho. 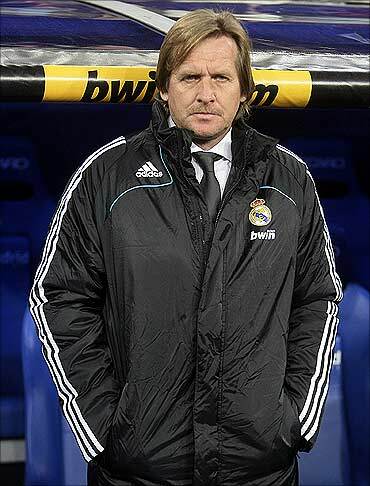 Remon's record at Real read thus: 12 wins, four draws and four losses in 20 matches in charge. The Brazilian was at the helm of affairs for exactly a year. He did his best, but Frank Rijkaard had assembled a better outfit at the Nou Camp. Luxemburgo led Real to seven successive league wins, putting them back in the title race but ended up losing it to Rijkaard's Barca. In the following season, Real started brightly. However, the introduction of a the Magic Rectangle (a new 4-2-2-2 formation), combined with mounting injuries and subsequently poor results hastened Luxemburgo's departure. He later moved to native Brazil and hasn't returned to Europe since. 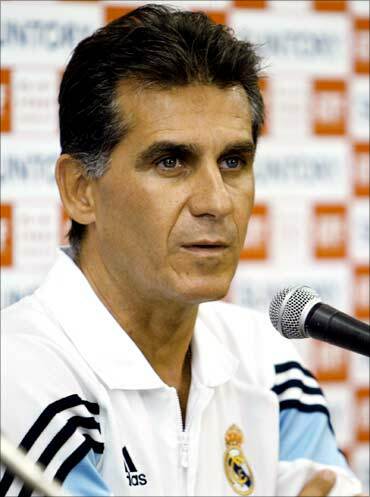 He was a reserve coach who was promoted to take charge after Luxemburgo's departure. And to give him the benefit of doubt, he never really had the time to build a side, let alone produce results. 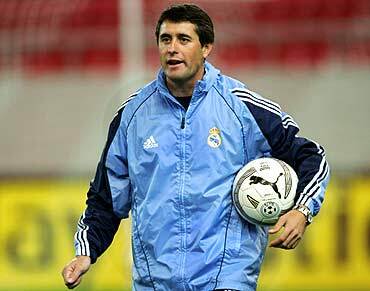 He joined Racing Santander as the head coach soon after his departure. The German won the league title (the club's 31st) in his first year in charge. The club secured a whopping 85 points and won with three games to spare. And Schuster soon became popular with the Real fans for reinstating the attacking flair synonymous with the club. However, problems soon started creeping in. A poor start to the next season had the German speaking out publicly about his team standing no chance of beating Barcelona in the El Clasico derby. Schuster soon stepped down in what was later termed a mutual decision. 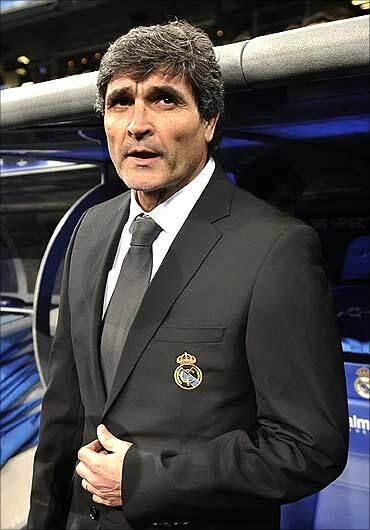 His success at underachievers Sevilla, where he won successive UEFA Cup titles in 2006 and 2007, made Juande Ramos a household name in Spanish football. A League Cup triumph in an otherwise disappointing tenure at Tottenham Hotspur was enough to convince the Real bosses that he was the right man to replace Bernd Schuster. His first match was an El Clasico defeat to Barcelona. But Ramos slowly but steadily managed to change his side's fortunes. He helped his side secure 49 points out of 51 possible in 17 consecutive games. However, after a shocking 6-2 drubbing by Barcelona at home, Real lost four successive matches, eventually ending nine points adrift of their rivals. And the return of Florentino Perez also ensured a complete overhaul, Ramos being the first one to get the sack. The most recent departure from the Bernabeu, Manuel Pellegrini also happens to be Real's most successful manager in terms of winning percentage (with 74.29%). The Chilean was signed from Villareal on a two-year deal -- at the start of the 2009-10 season and was handed the charge of a team that that emptied its pockets considerably (around 250 million euros) to acquire big ticket players like Cristiano Ronaldo, Kaka, Karim Benzema, Xabi Alonso, Alvero Arbeloa et al. Pellegrini had to endure early exits at two competitions -- an opening round defeat to lowly Alorcon in the King's Cup and, more significantly, a shock second round defeat at the hands of Olympique Lyon is the Champions League. Considering the final was played at Real's Santiago Bernabeu, it was a huge disappointment. 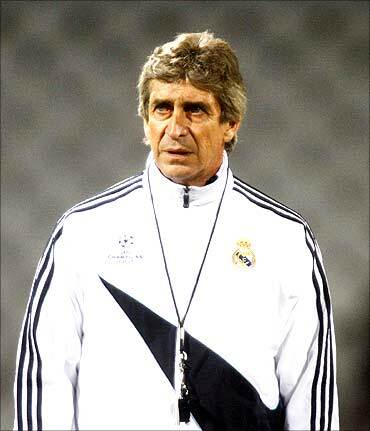 To his credit though, Pellegrini did considerably well in the La Liga Real, winning a season-record 31 games and scoring a whopping 102 goals. However, his side's failure to get the better of defending champions Barcelona both home and away cost Real the title. And Pellegrini lost his job, after just a season in charge. The Chilean palpably was bitter. "I came here (Bernabeu) with high hopes but unfortunately wasn't able to do what I wanted to. There were a lot of disagreements in the club," he lamented, before adding, "It hurt..."